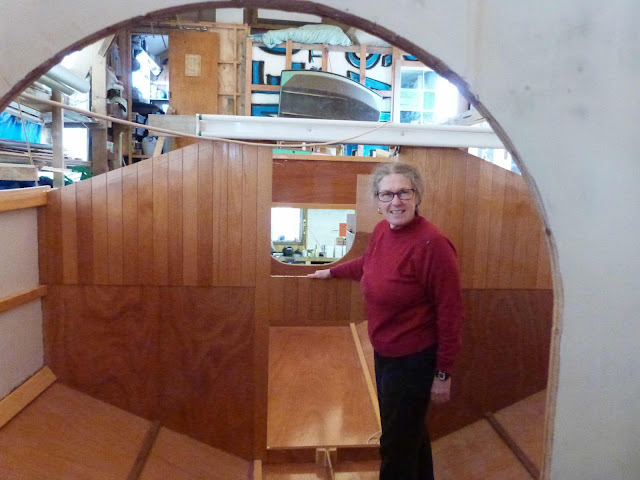 Just a reminder of what she's intended for, this little ship is intended as a long range sail and oar adventure boat, capable of multi day coastal voyages in open waters. Water ballasted, with a SCAMP style "veranda", light and slippery enough to row if needed, and able to self recover single handed from a full rollover or capsize. I am developing plans as I build, and they should not be long in becoming available. I’ve not done much boatbuilding of late, while it’s a calming and rewarding way to spend a few hours there are times when other things have to take priority so the partly planked hull has been just sitting for the past few months making me feel guilty every time I walked past. 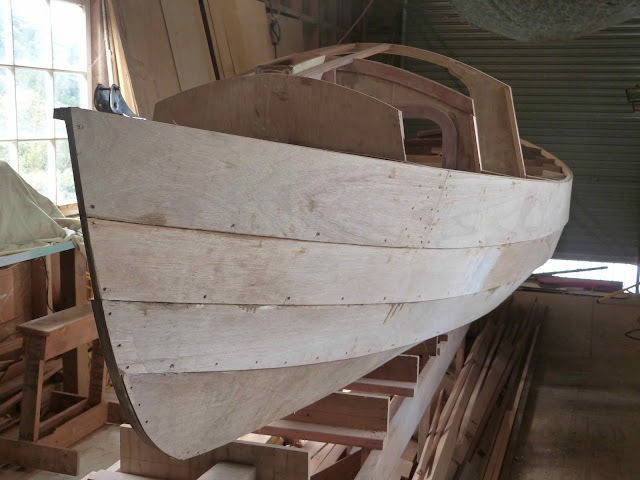 But there has been progress, in order to produce a comprehensive build manual for what is a slightly unusual boat I decided to plank up one side so I could get good clear pics of the inside structure. 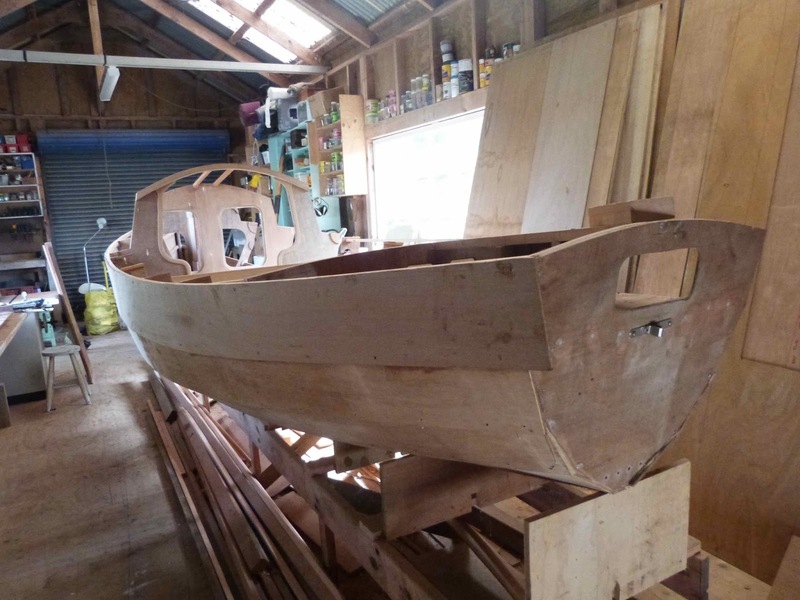 I’d planked her with two each side to stabilise the structure, to prevent the fitting of stringers and planks on the one side pulling her frames out of line, then planked up the port side to the gunwale. Note that I’ve left the top two stringers off the starboard side so I can fit the “offcentercase” more easily. The ‘case is a big lump of a thing and its going to be a task to get it positioned and fitted anyway, better access will simplify the task. The "Sharp end". 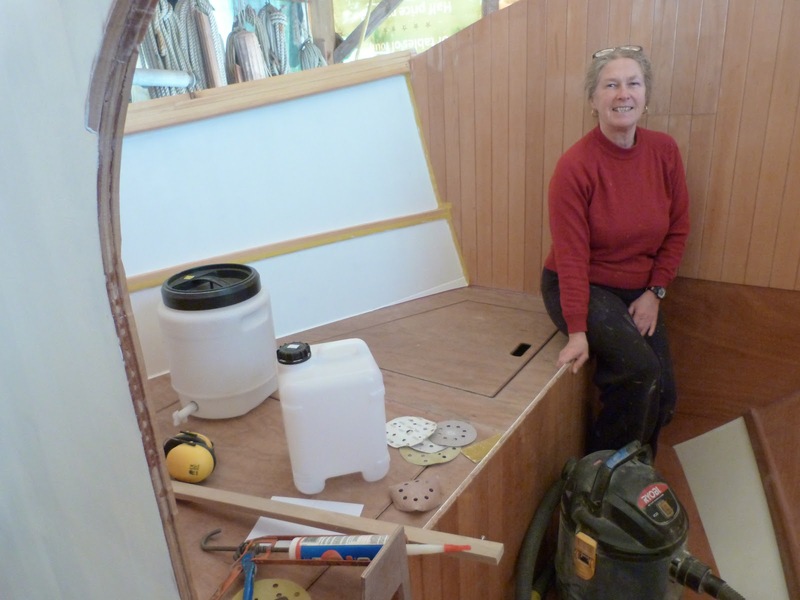 Yes I know the under edges of the lapstrake planks are uneven, its my practice to flip the boat over and fair them with a rebate plane before filling, sanding and painting. Inside aft, if you look past those temporary braces you can see the "stand up at the helm" space and the lazarette where the mizzen mast box is. There will also be a deck box for the main anchor and rode under the tiller which is to be hinged between the two holes at the top of that bulkhead, the tiller lines go through there. Stern, some trimming yet to be done but the rudder fittings have been dry fitted into reinforced bolt holes. A view of the structure from the bow end, simple plywood frames and stringers, the stem is three layers of plywood and the middle layer extends as a spine which locates the frames all the way to the back of the "cabin" The little semicircles on the frames are plywood doublers that make it easier to screw the stringers into place. My "home away from home", a 2.5m long cockpit, lots of space, it would be a piece of cake to put filler pieces between the rowing seat support stringers on the inside of the seat fronts to form a double bunk if you wanted to take your sweetie cruising. Mine, ( Sweetie that is) wants to come along in her kayak but she cant sleep in that so I've planned on a suitable space from first concept . The "offcentercase" goes down the right hand side of the cockpit floor as you see it here. I have dry fitted the cockpit floor, that’s a nice big space and I’ve laid myself down and relaxed to see how it feels. Plenty of space, it feels nice and secure, and the space under the SCAMP like “veranda” being a little bigger than Long Steps fat little relative is big enough to sit in comfort with room for the cookstove and galley tasks to be done in a sheltered space without having to erect the cockpit tent. She’s looking good, at least from the port side, slippery, the beam being quite narrow at the waterline when she’s upright, the intention being to make her easy to row, but the center of buoyancy moves out very quickly as she heels so there is stabiity there to carry a good sized sail area. I’d rather sail than row, the latter being for the most part to enable me to row into a marina where the rules prevent sailing in. A couple of minor setbacks, I had gone to the trouble of scarfing up a stack of stringers, rounding all the inner edges with a router and sanding them off nicely. But found that kiln dried Agathis Vitensis can be very brittle. ( I already knew that, but thought that the easy curves in this boat would be gentle enough to get them around). Not what I wanted to hear, but my habit of dry fitting things first meant that there was no glue to clean up when I took the broken pieces off, I can use those bits elsewhere. Hook up the trailer and off to a local sawmill that specialises in Cupressus Macrocarpa. Thats Monterey Cypress in the USA where it comes from, and “Macrocarpa” here in NZ, bought a big plank of the stuff, 50 x 250 x 4.2m and sent a few hours making up more stringers. The other thing was that I’d been offered a heap of the heads from leadhead roofing nails to help with the casting of the weight in the offcenterboard, I’d got involved in conversation and forgot to load them into my truck so had to scrounge around to find enough wheel balance weights to make up the difference. I got that cast though, no problem. 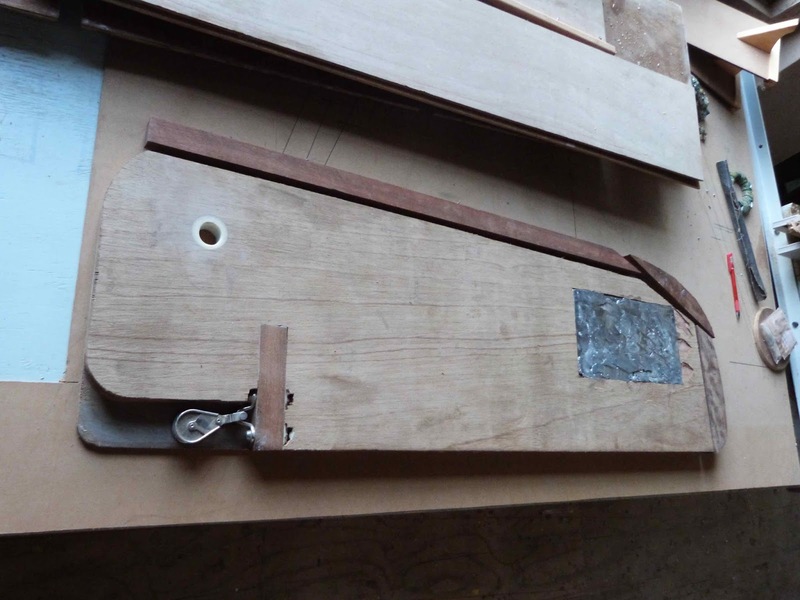 The "offcenterboard", thats the core and one side with the lead cast in place, the hardwood protective leading edge and tip ready to glue into place and the lifting tackle pulley in place. There is another layer of plywood to glue onto the face that you can see there. 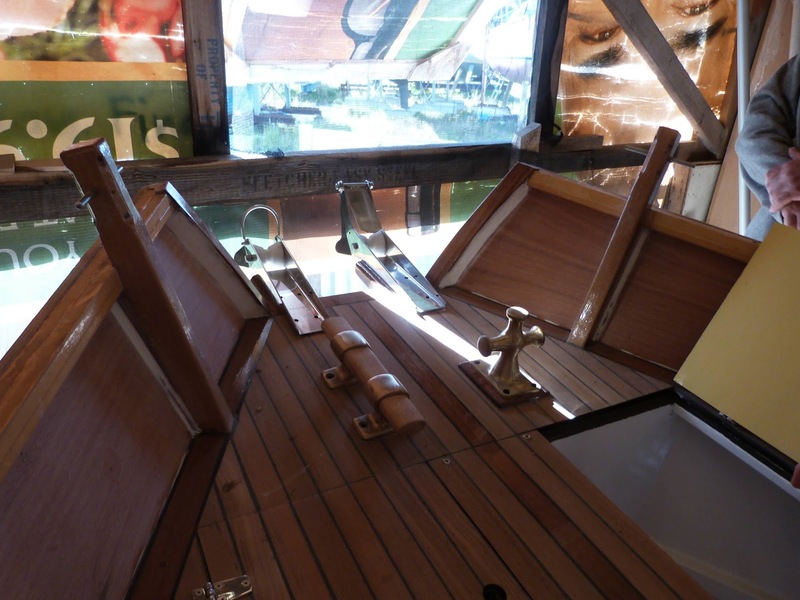 That pulley takes the 'board lift line which runs from the forward end of the dogleg shown in the pic of the case side below, around the pulley and back out the forward end, around a mast head halyard box and along the seat front with a big reduction tackle on that end. The hardwood block that its bolted to is to make very sure that its secure, cant pull out no matter what the provocation is. I dont like putting a multi part tackle inside the "case though, two parts like this is ok but more tends to get tangled and its not easy to get at, hence the big four part tackle being "outside". 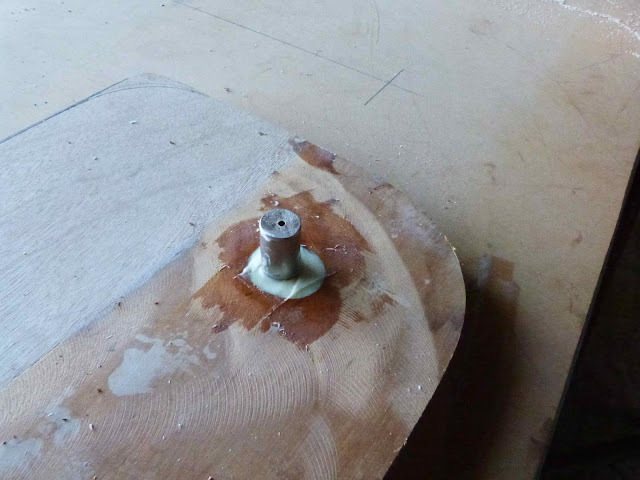 One of the things I get asked is “how do I make a mould for the weight in the middle of my centerboard? Or, “how do I stop the wood from catching fire when I pour the melt into the cavity?”. The core of the offcenterboard in Long Steps is two layers of 12mm plywood, I cut out the cavity, glued the outside piece of 6mm plywood to one side, and poured the lead straight in. The other side 6mm piece was glued on after planing the lead down flush with a power plane ( take care doing this, use a “slicing action” rather than cutting square as it reduces the chance of a violent kickback). When you are going to melt lead for very simple casting like this, first of all make sure that the wood it is being poured into is dead dry . Any moisture will flash in to steam and boil through the molten lead causing splatter and a porous casting. Second, don’t overheat the melt, get it just molten and pour as a continuous stream to avoid layering. You’ll get some smoke but in my experience not much, and the minor amount of charring will be hidden inside the board where its of no consequence. Heavy boots, heavy clothing, eye protection and a well ventilated space, stand upwind. Its fun but be safe. 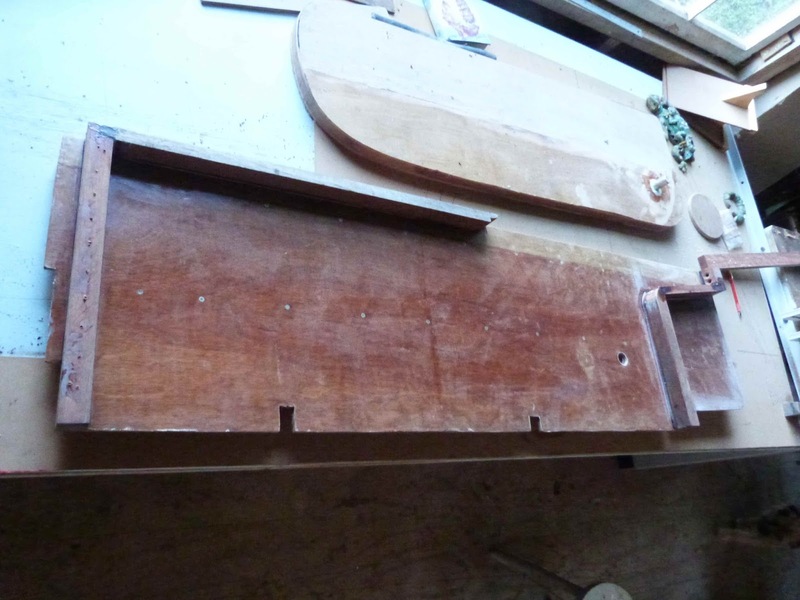 Here, the last layer of plywood is glued on, and I'm getting the pivot pin hole sorted. I've drilled it well oversize, (Holesaw) and filled it with fibre reinforced epoxy, set the pin ( a chunk hacksawed off an old bent piece of stainless steel propshaft that came with a bent propellor I'd bought for the bronze, note that I've drilled and threaded the end of it so I can put a bolt in there to make it easier to grip should I want to pull it out) I've coated the pin with silicon car polish as a release agent so I could pull it out when the epoxy had set, and yes it came out without much of a fight. The "case." 9mm plywood with two layers of 6 oz fiberglass on each side, put on before the case packers that you can see there were fitted. Those packers are fitted with glue, screws that overlap within the packers and will have through bolts in the high load areas. They're made of Australian Jarrah hardwood, and you can bet that its hard! The "dogleg" at the top houses a 2/1 purchase which is increased by a 4/1 purchase along the seat front in the cockpit, thats a heavy 'board". Next job, fit the double doublers, drill for the pivot and reinforce the pivot pin holes in the "case, then I can fit it and get on with planking. Annie is making progress on her floating home. SIBLIM, ( Small is beautiful, less is more) is coming along well, as always with projects like this its taking longer than expected but for a solo build learning the skills as she goes, SIBLIM is coming along well. Although only 26 ft long, this boat has an amazing amount of space, there is a luxury sized bunk up forward with good standing space to the side, lots of storage, a head and wash space and more storage just aft of that and a lovely spacious main cabin back from that. Being less than tall is a real help in the headroom requirement, but even for me at a good handspan taller the spaces feel comfortable, and getting around inside this little ship wont be hard on my head should I contact the overhead. 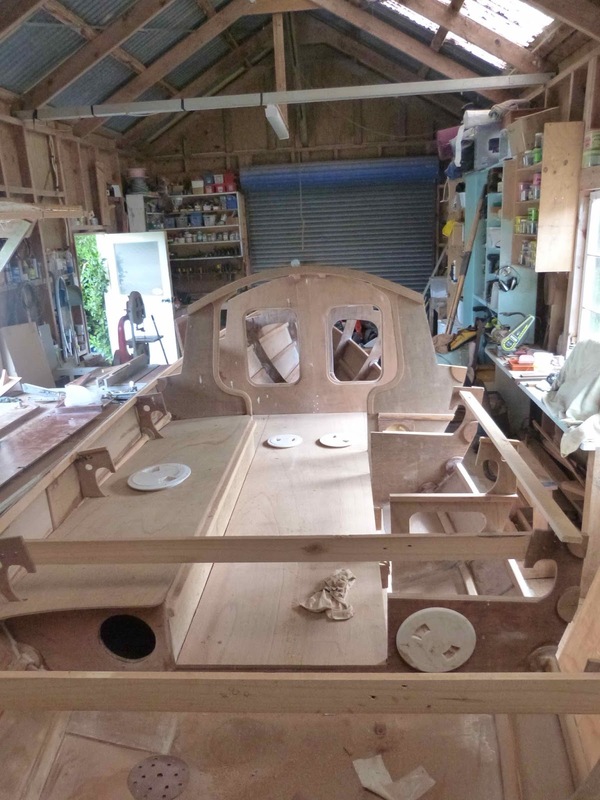 The only area that is really finished, ( just some fittings to be bolted in) is the anchor deck, that’s the area just back from the bow where one stands to handle the ground tackle. Now, I’ve stood on a rounded, wet and slippery fiberglass foredeck deck while heaving a 25 lb anchor and a heap of chain up and it wasn’t a nice place to work. But this area, with its wide Junk style stem, lowered deck level leaving good bulwarks each side and secure footing is a much safer place. 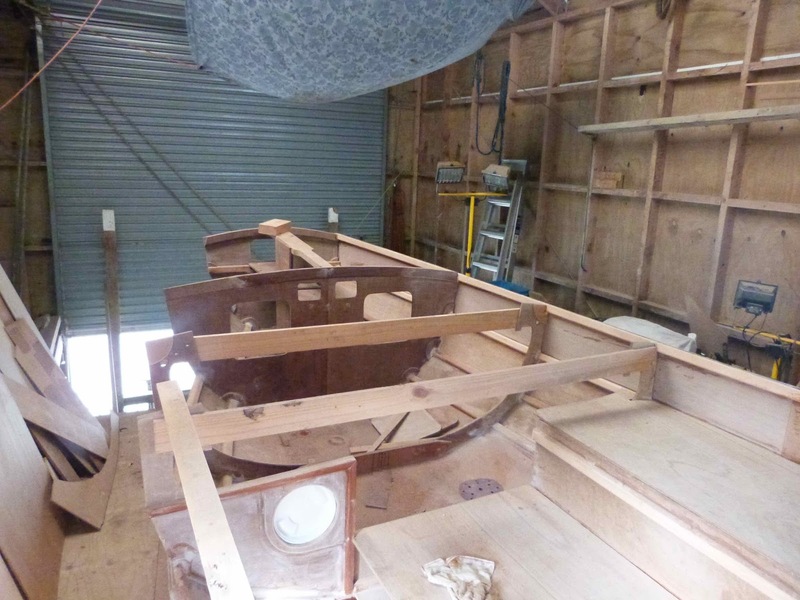 Here are some pics of the interior and foredeck, I’ll be back there again soon and will report as the cabin fitout goes ahead. 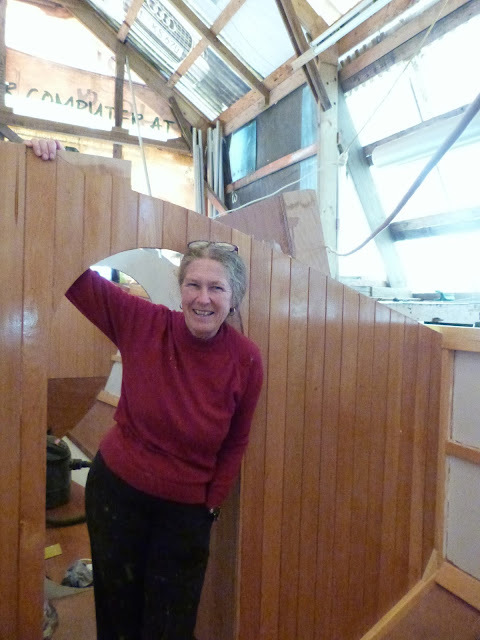 The companionway to the head and forward cabin, plenty of space here. Thats Annie of course, ever the smiling one. Sumptious space in the "bedroom". 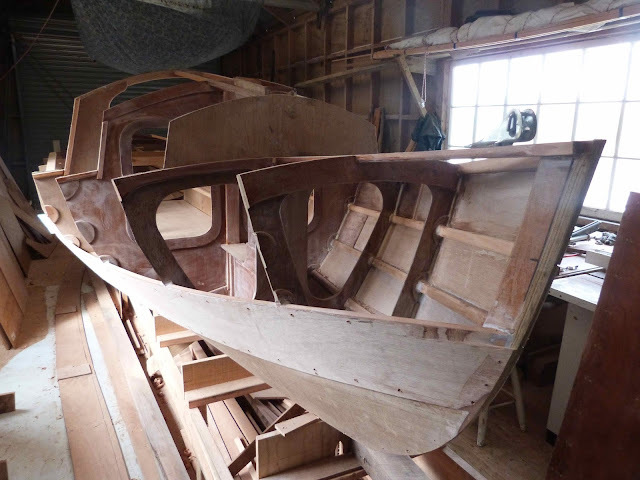 Now thats a foredeck that I'd be happy working on. The view from forward through the main cabin to to cockpit, lots of work to do there as yet but progress is being made. The dink on the back wall of the shed is my "Offcuts" design, the predecessor to "Scraps".